On its 90th anniversary, a look at one of Toronto's major war monuments. Shaping Toronto looks at the decisions, processes, and trends that form the city we know and love. 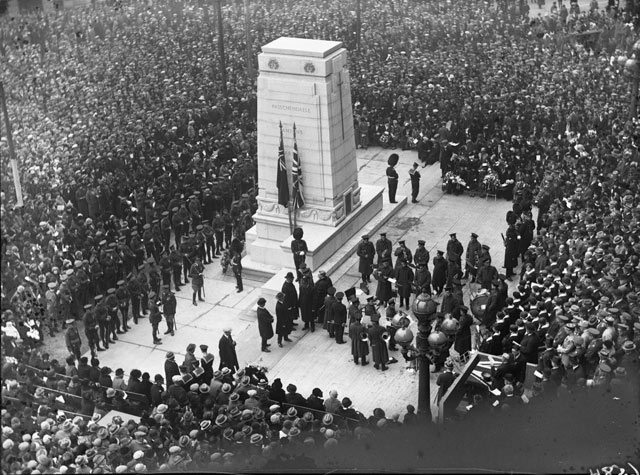 When this photo appeared in the November 12, 1925 edition of the Globe, the caption read: “The picture was taken by the Globe staff photographer shortly after the cenotaph had been unveiled by his Excellency, and before the hundreds of wreaths which now cover the base of the monument had been deposited in token of remembrance by the relatives and friends of the noble dead to whom the memorial is erected.” City of Toronto Archives, Globe and Mail fonds, Fonds 1266, Item 6584. As the cenotaph marks its 90th anniversary this Remembrance Day, it’s worth reflecting on the role such monuments play, and, especially in light of current debates on appropriate memorials, what some people have considered to be desecrations. When a city council special committee contemplated permanent sites for a monument in 1924, its members felt that erecting it in front of Old City Hall would render it inconspicuous due to space limitations and the height of surrounding buildings. While they preferred replacing an old bandstand in Queen’s Park, veterans felt it should remain at Old City Hall, where annual ceremonies had been held since 1920. 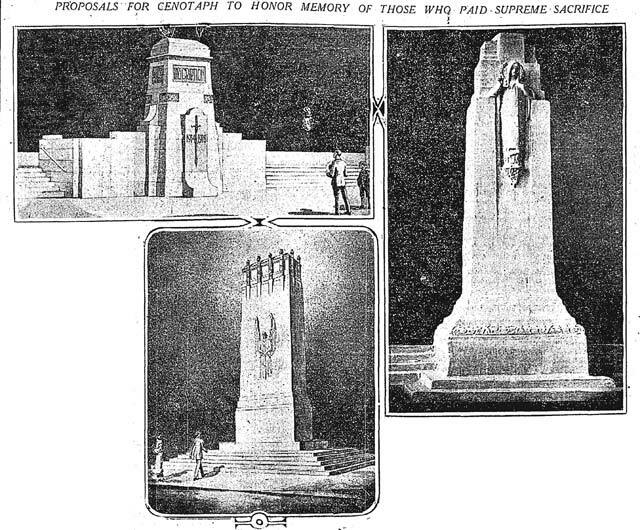 Three of the potential designs for the cenotaph. Toronto Star, October 27, 1924. When city officials arrived at the cenotaph at 6 a.m. on November 11, 1925, they found two memorial wreaths had been left overnight: an anonymous assembly of chrysanthemums and one in memory of Private William Bird from his children. 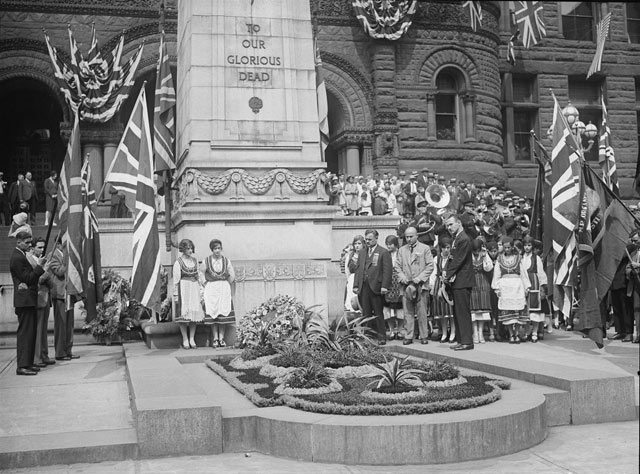 During the ceremony, only wreaths presented by Haig (who, unable to attend, drafted Byng as his stand-in) and the city were allowed to rest on the monument. Dozens of others, representing everything from orphanages to Belgian soldiers in town for the Royal Winter Fair, were banked around Old City Hall’s steps. One addition was made almost immediately. Members of the Royal Naval Volunteer Reserve Officers’ Association were upset that none of the seven battle names inscribed on the sides involved the Navy. Their suggestion of Zeebrugge was added to the rear. Macedonian parade, scene at cenotaph, September 1, 1929. City of Toronto Archives, Globe and Mail fonds, Fonds 1266, Item 17805. The cenotaph quickly became the site of memorials by numerous groups honouring their war dead. Mohawk singer Os-ke-non-ton laid a five foot long “arrow of memory” in December 1925 to commemorate First Nations soldiers. The monument was an official stop during the annual July 12 Orange Parade. Few days went by where there wasn’t a fresh wreath lain upon it. 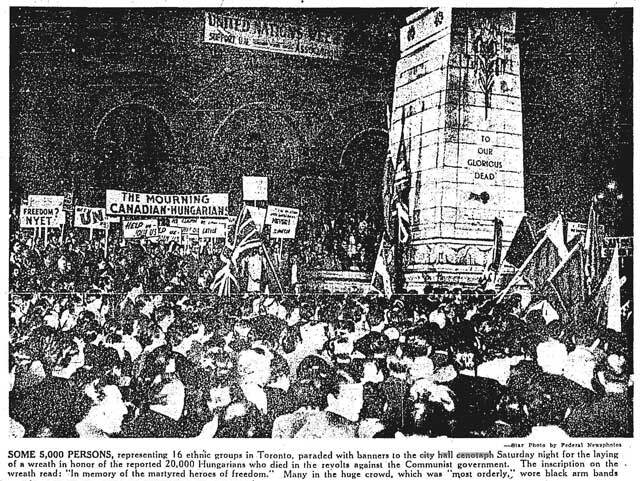 By the late 1940s, as the dates to another world war were inscribed into the cenotaph, some quarters felt the public wasn’t respectful enough. Letters to newspapers complained about workers resting on it for lunch or smoke breaks, drunks sleeping on it, and the occasional dice game at its base. Police placed “keep off” signs on the cenotaph, while some city councillors wanted to erect spikes to prevent anyone from leaning too close. Some of these efforts to turn the monument into an untouchable shrine echo current arguments on how displaying Christmas decorations too early offends the sanctity of remembering dead soldiers, even if they fought for the freedom to do such things. Source: Toronto Star, October 29, 1956. But this openness didn’t last long. Following a spat between Croatian and Yugoslavian groups over wreaths that may have honoured soldiers who died while allied to Nazi Germany, the Board of Control ruled in May 1957 that only dead Canadian military personnel would be officially commemorated at the memorial. Who was considered appropriate to lead a Remembrance Day ceremony at the cenotaph service arose in 2013, when there were calls for Mayor Rob Ford to skip the ceremony a week after admitting to smoking crack cocaine. “That he thinks he has the moral authority to deliver a remembrance address,” observed the Globe and Mail’s Marcus Gee, “is simply staggering.” Deputy Mayor Norm Kelly observed that it was important for the officeholder to show up regardless of their personal problems. Ford was booed as he took the stage. 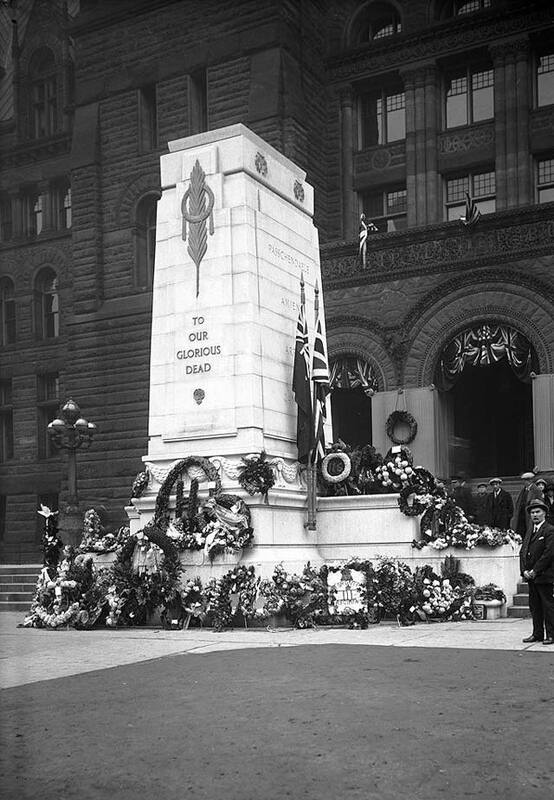 Cenotaph, City Hall, decorated with wreaths, Remembrance Day, view from southeast , November 11, 1925. City of Toronto Archives, Fonds 200, Series 372, Subseries 41, Item 549. But booing figures like our former mayor should not be the point of attending a ceremony at the cenotaph. Standing in front of the site should rise above petty concerns like who can or can’t be honoured there. It provides an opportunity to think about military conflict in general, both in terms of the dead and the grey areas which are always present. Don’t restrict your moment of contemplative silence to November 11. Additional material from the November 11, 1925 and November 16, 1925 editions of the Globe; the July 24, 1947, September 25, 1947, November 1, 1956, and November 11, 2013 editions of the Globe and Mail; and the May 27, 1924, October 27, 1924, November 3, 1925, November 11, 1925, November 16, 1925, December 4, 1925, October 29, 1956, Ocrober 30, 1956, and November 1, 1956 editions of the Toronto Star.